The Multi-currency feature of MoneyWorks Gold allows for purchasing and sales to be made and tracked in more than one currency, and for bank accounts and accounts receivable/payable to be held in a currency other than the local one. Multi-currency is turned off by default and needs to be enabled. Select your base currency (i.e. your local currency) from the menu. 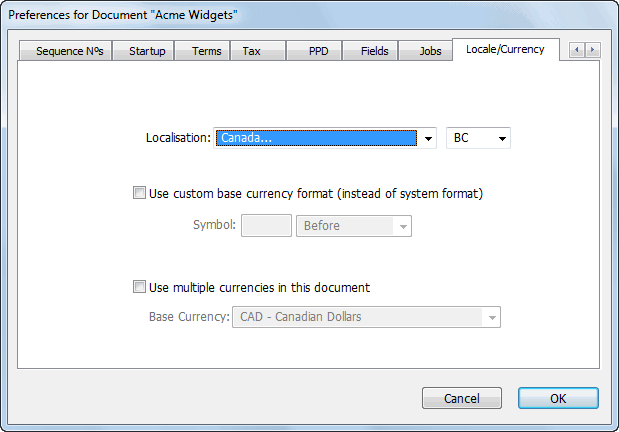 Note: Once you have created a currency, you will not be able to turn off the Use multiple currencies option.